The Duo Sports double wire sports fencing system has been designed and evolved from the Duo6 and Duo8 perimeter fencing system. Ideal for both light usage courts or heavy use with MUGAs (multi use games areas) the Duo Sports double wire sports fencing system is ideal for use in urban or rural settings. One of the major stumbling blocks during the planning of sports courts is noise that occurs during play. The Duo double wire sports fencing system is manufactured from dual horizontal 6mm or 8mm wires sandwiching single 5mm or 6mm vertical wires. This produces a 50mm x 200mm mesh pattern that is not only strong and vandal resistance but also offers the best value. 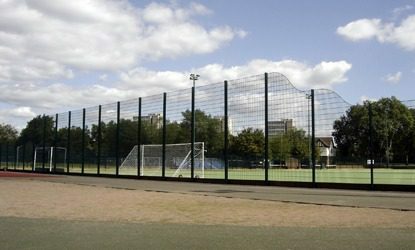 Like Duo, the Duo Sports double wire sports fencing system is available using 6mm or 8mm twin horizontal wires. However, Duo Sports has been developed to overcome the rattle that so many residents object to. This double wire sports fencing system uses twice as many fixings to mount the panels to the posts, ensuring that there is minimum movement between the two. Furthermore, each fixing uses a synthetic EPDM insert to insulate the panel from the post. Fixings every 200 mm and synthetic rubber inserts at each fixing virtually eliminates rattle during play. Each double wire sports fencing panel can be cranked inwards to increase ball retention and the addition of Zaun football goals and basketball units will increase user participation. A clamp bar covering panel ends ensures a safe playing surface with no sharp edges. Duo Sports double wire sport fencing is available with gates designed to suit the fence line and can be supplied in your choice of RAL colours. Samples of Zaun Duo Sports are available upon request, to request your free sample please click here.